A U.S. Air Force F-35A Lightning II, A-10C Thunderbolt II, P-51 Mustang, F-16 Fighting Falcon, and P-40 Warhawk fly in formation March 4, 2018, during the annual Heritage Flight Training and Certification Course at Davis-Monthan Air Force Base. During the course, aircrews practice ground and flight training to enable civilian pilots of historic military aircraft and U.S. Air Force pilots of current fighter aircraft to fly safely in formations together. 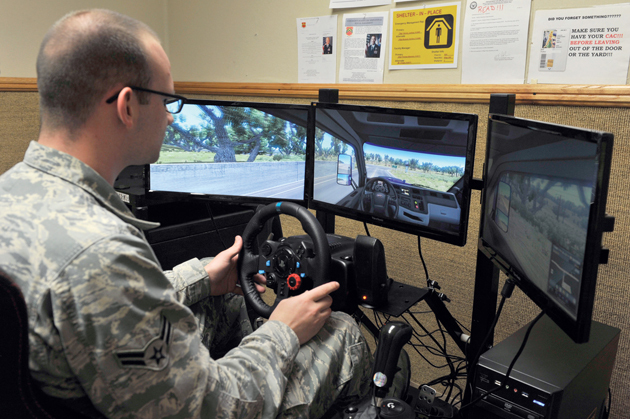 Airman 1st Class Larry Key, 56th Logistics Readiness Squadron vehicle operator dispatcher, trains on a driving simulator March 6, 2018, at Luke Air Force Base. The simulator helps Airmen practice their skills without safety risks. Tech. Sgt. 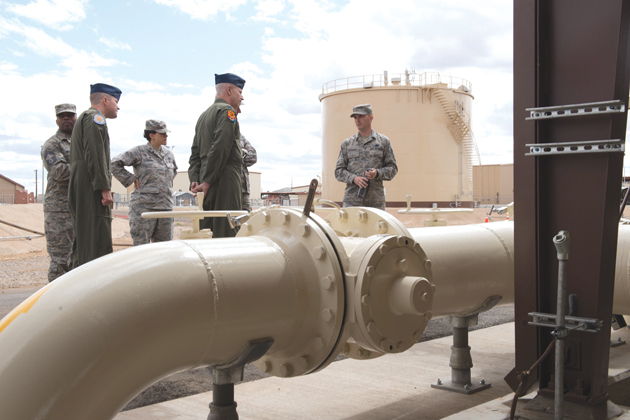 Donald Grunden, 56th Logistics Readiness Squadron Fuels Management operator, briefs members of Luke’s command team on the new fuel pump house following its ribbon-cutting ceremony March 15, 2018, at Luke Air Force Base. 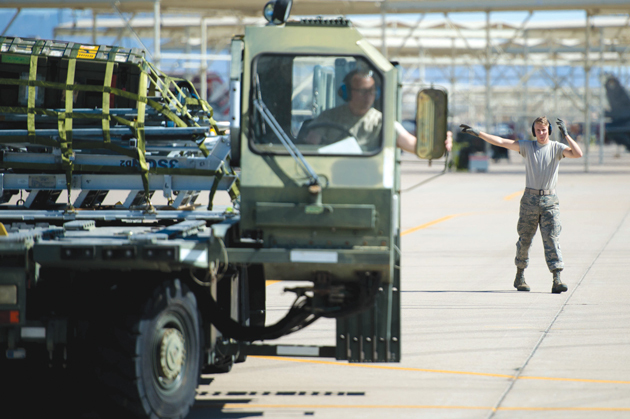 The pump house, along with a simultaneously developed fill stand, allows fuel trucks servicing jets to resupply directly from the flightline instead of having to drive to external pumps. 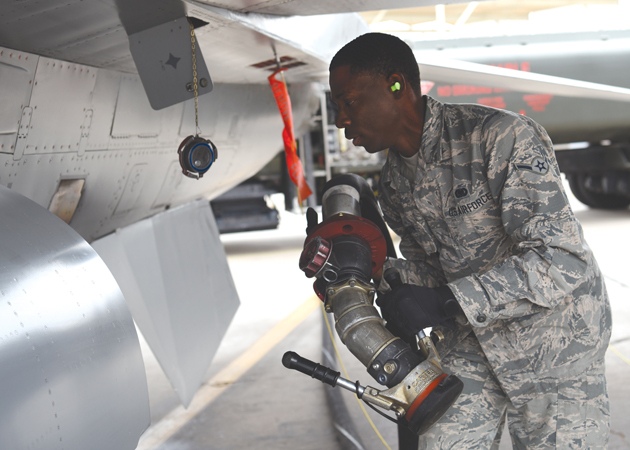 Airman Johnny Jackson, 56th Logistics Readiness Squadron fuels operations distributor, prepares to connect a fuel hose to an F-16 Fighting Falcon April 19, 2018, at Luke Air Force Base. Jackson was part of a 56th LRS team that won a fuel truck competition, beating out teams from Davis-Monthan AFB and Nellis AFB, Nevada. 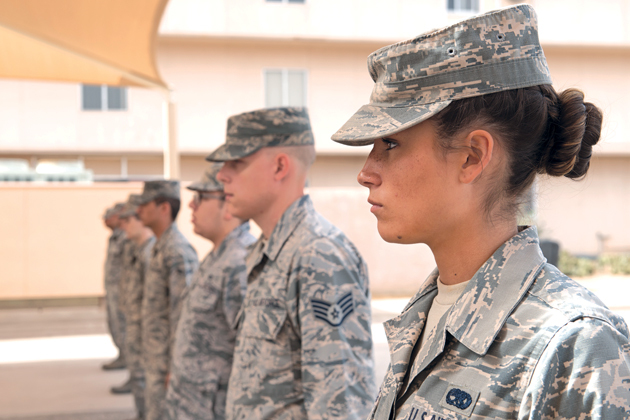 Local honor guard Airmen stand at attention as they learn from instructors from the U.S. Air Force Honor Guard team April 16, 2018, at Luke Air Force Base. Members of the Air Force Honor Guard team came to Luke to train local honor guard members on special techniques, formations and demonstrations. 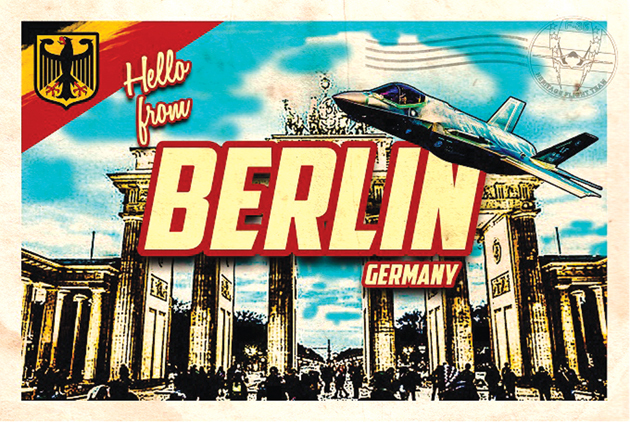 Two F-35A Lightning IIs assigned to the 61st Fighter Squadron, 56th Fighter Wing, landed in Berlin, Germany, April 20, 2018, as part of the United States delegation for the 2018 Innovation and Leadership in Aerospace Berlin Air and Trade Show. 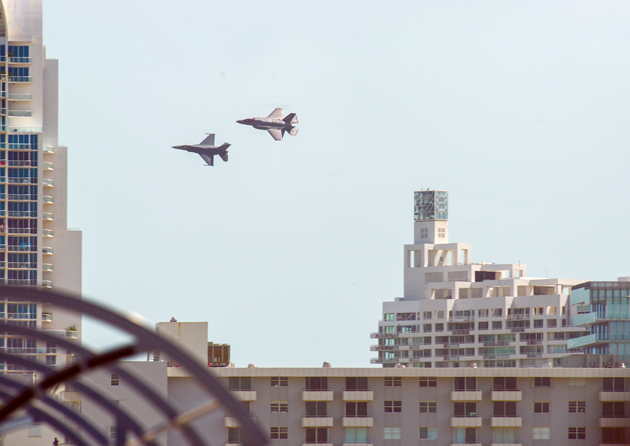 An F-35A Lightning II and F-16 Fighting Falcon fly in formation as part of a heritage flight May 27, 2018, during the 2018 Hyundai Air and Sea show at Miami Beach, Florida. 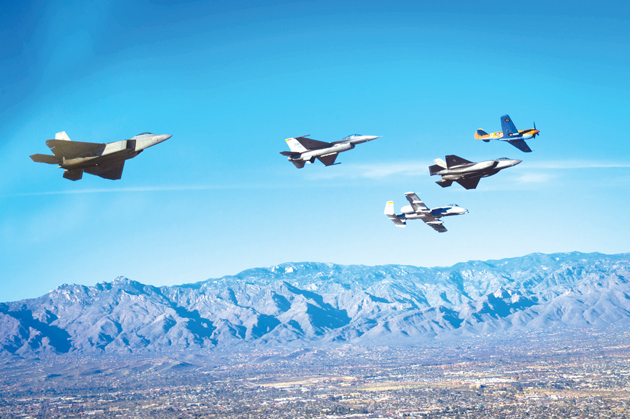 A heritage flight is a dynamic display of the past, present, and future of aviation in the U.S. Air Force. 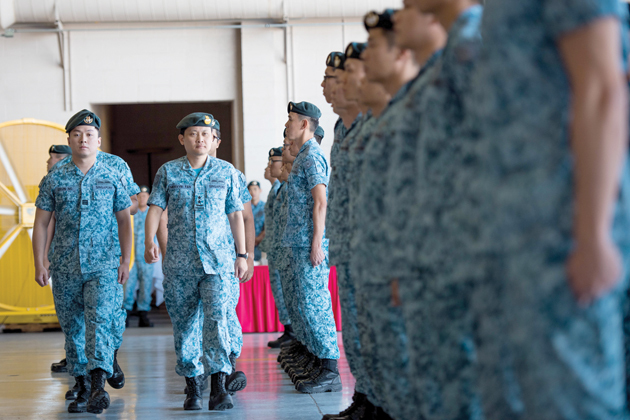 Maj. Gen. Mervyn Tan Wei Ming, Republic of Singapore chief of air force, performs a ceremonial inspection of 425th Fighter Squadron Airmen May 22, 2018, during a parade ceremony at Luke Air Force Base. 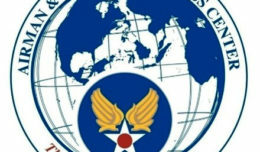 The ceremony celebrated 25 years of U.S. Air Force and Republic of Singapore air force partnership within the 425th FS. 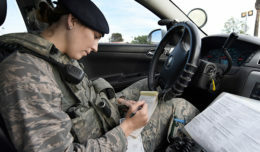 Airman 1st Class Joel Schwind, 56th Logistic Readiness Squadron air transportation journeyman, guides Tech. Sgt. Gerald Clark, 56th LRS NCO in charge of small air terminal May 23, 2018, as he drives on the flightline at Luke Air Force Base. The team offloaded a pallet of supplies in support of the Royal Australian air force’s F-35 training mission at Luke. Brig. 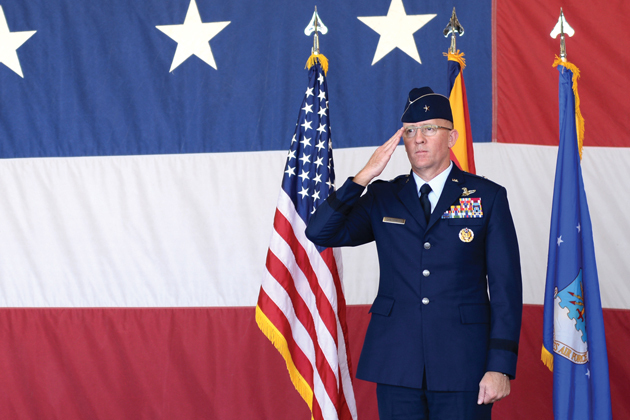 Gen. Todd Canterbury, 56th Fighter Wing commander, salutes his new wing for the first time moments after assuming command June 20, 2018, at Luke Air Force Base. Canterbury most recently served as the director of the F-35 Integration Office at Headquarters Air Force. 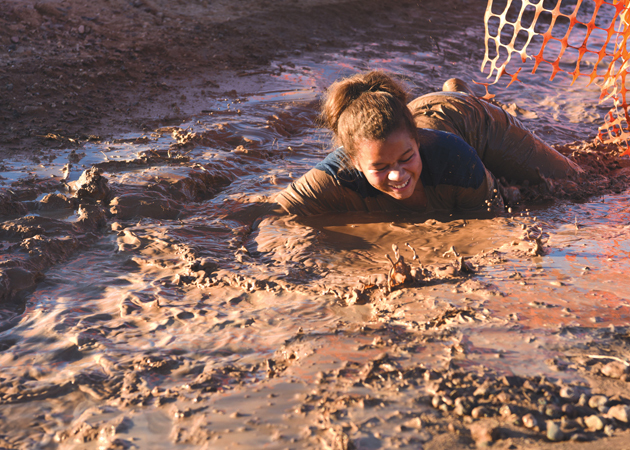 A participant crawls through an obstacle June 22, 2018, at the 56th Force Support Squadron’s 2018 Jump in the Mud 5K at Luke Air Force Base. With the addition of some water, Luke’s desert locale makes it an ideal setting for some fun in the mud. Staff Sgt. 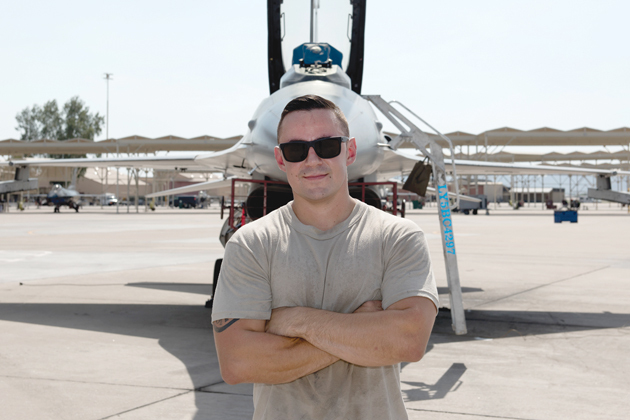 Tanner Apple, 309th Aircraft Maintenance Unit dedicated crew chief, poses for a photograph Aug. 20, 2018, at Luke Air Force Base. Apple was awarded the 2017 Thomas N. Barnes award for the best dedicated crew chief in the Air Force. Names of the fallen first responders of 9/11 hang from streamers over the American Flag Sept. 11, 2018, at Luke Air Force Base. 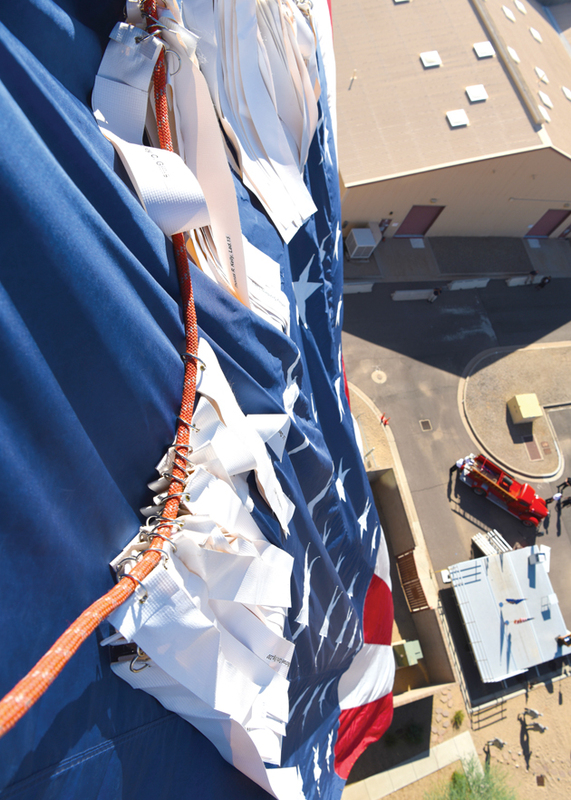 Airmen carried more than 400 streamers to the top of the air traffic control tower in remembrance of the lives of first responders lost on 9/11. Airmen from the 56th Fighter Wing partake in a meal and converse Sept. 6, 2018 during the flightline feast at Luke Air Force Base. 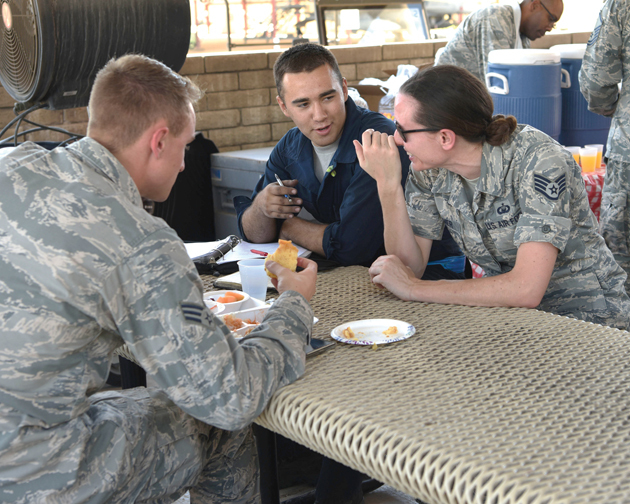 The flightline feast not only gives Airmen an opportunity to speak with members of the Luke Chaplain Corps, but helps build camaraderie amongst Airmen in various career fields. 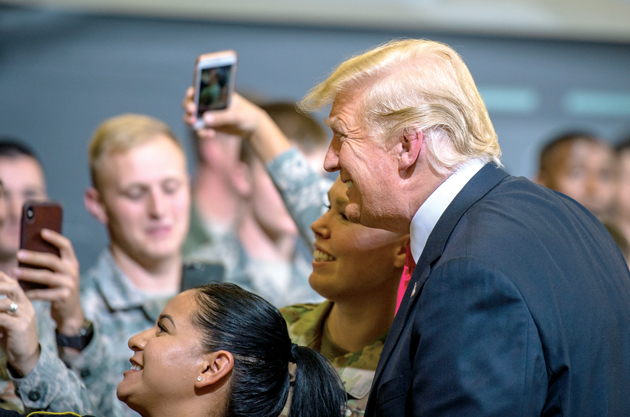 President Donald J. Trump poses for photos with Airmen Oct. 19, 2018, during his visit to Luke Air Force Base. Trump acknowledged and emphasized the importance of Arizona’s military presence, including Luke’s role in building the future of airpower. 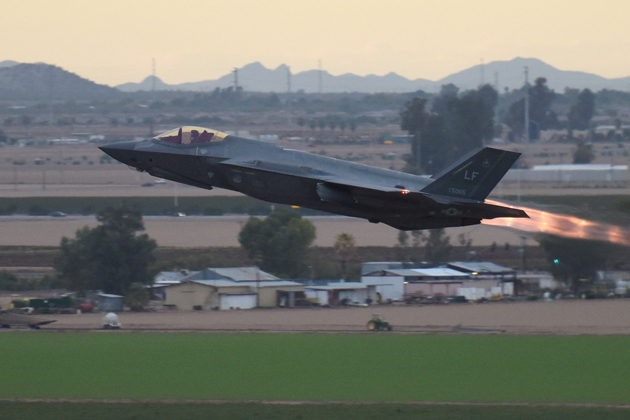 A 62nd Fighter Squadron F-35A Lightning II takes off for an evening sortie Oct. 11, 2018, from Luke Air Force Base. Pilots conduct periodic, routine night flying in order to train for nighttime and low-light operations. 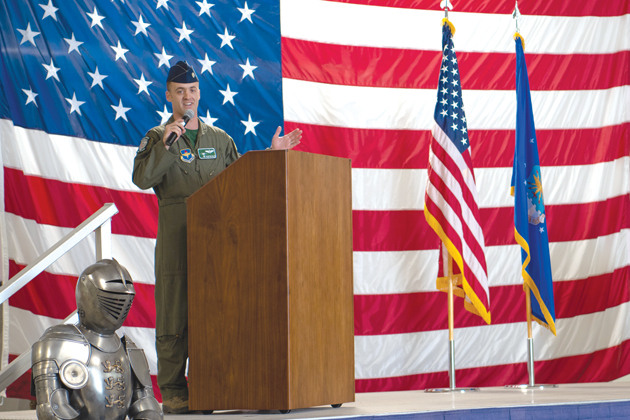 Lt. Col. Robert Miller, 308th Fighter Squadron commander, provides remarks at an assumption of command ceremony, Nov. 30, 2018, at Luke Air Force Base. 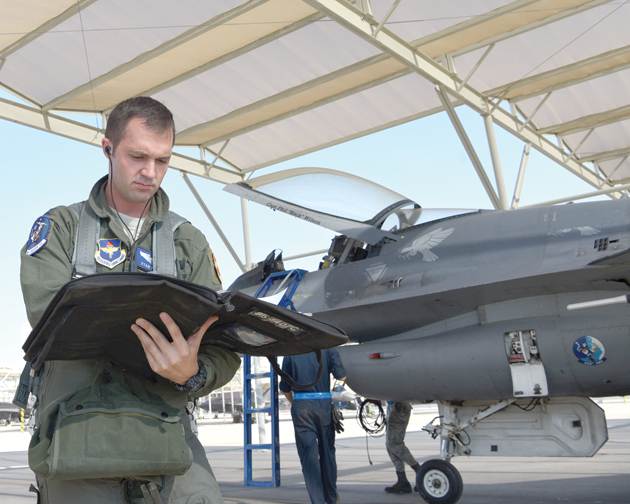 Miller is an F-35A Lightning II instructor pilot who assumed command of the reactivated fighter squadron. 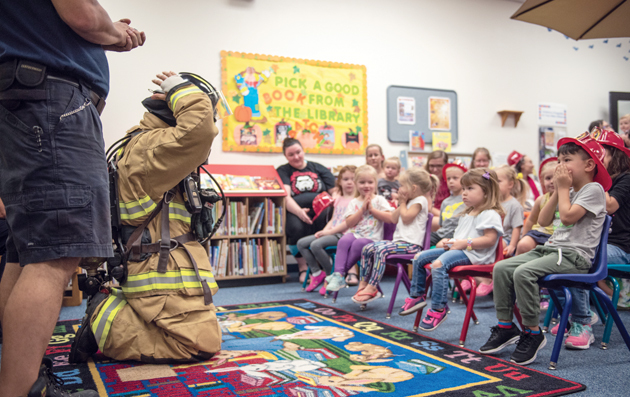 Luke Air Force Base firefighters demonstrate the proper wear of firefighting equipment during their visit to the base library as part of Fire Prevention Week Oct. 3, 2018. Throughout Fire Prevention Week, activities were held on base for Airmen and their families to receive information on preventive measures they can take to exercise fire safety. 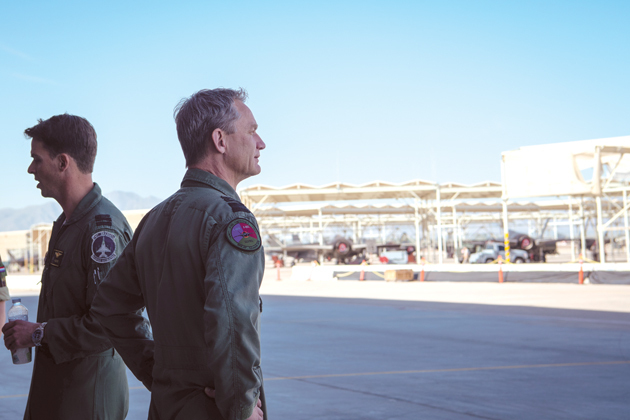 Lt. Gen. Dennis Luyt, Royal Netherlands Air Force commander, looks out over the flightline toward the new home of the Dutch F-35A Lightning IIs Nov. 21, 2018, at Luke Air Force Base. Members of the RNLAF are part of the reactivated 308th Fighter Squadron that stood up Nov. 30, 2018. 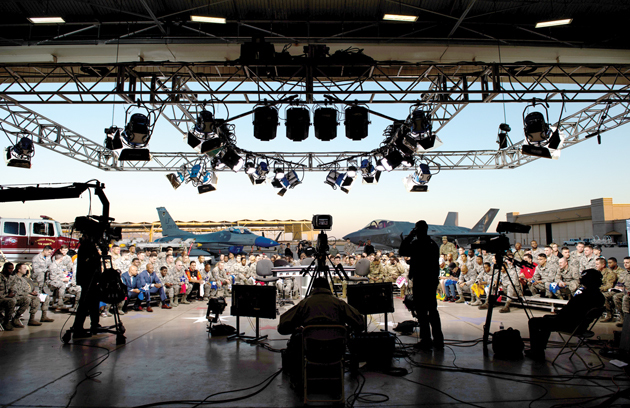 Thunderbolts gather for an ESPN “First Take” live show Nov. 9, 2018, at Luke Air Force Base. Every year, the live two-hour show honors service members near Veterans Day by telecasting their show from military installations. 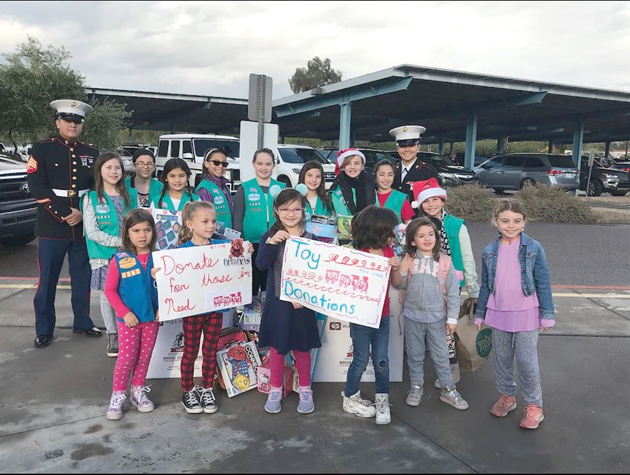 Marines from the U.S. Marine Corps Bulk Fuel Company “C” at Luke Air Force Base gathered toys and donations for this year’s Toys for Tots distribution. 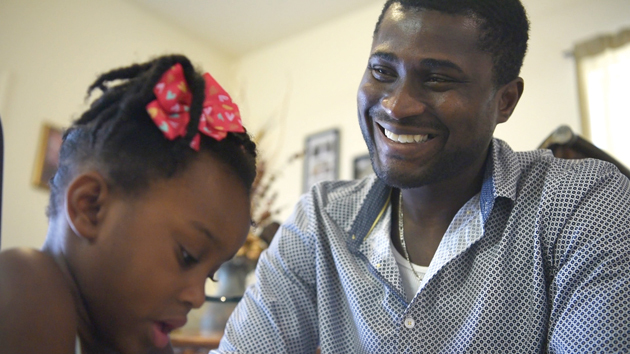 Toys were gathered throughout the state from October to December, and were distributed to more than 300 families through the month of December 2018. 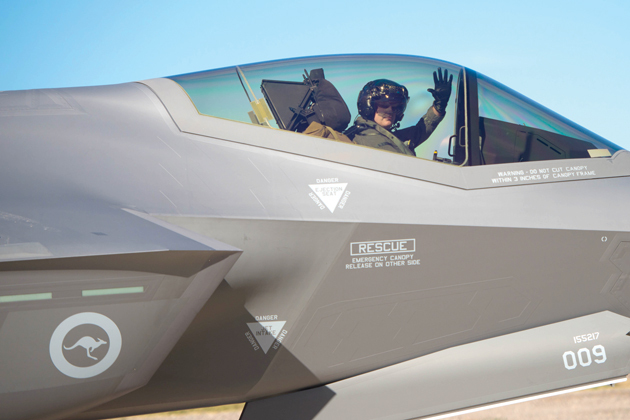 Royal Australian Air Force wing commander Darren Clare, F-35 Lightning II pilot, waves goodbye Dec. 3, 2018, while taxiing at Luke Air Force Base. The RAAF was preparing to launch two F-35A Lightning IIs for their historic arrival in Australia several days later. 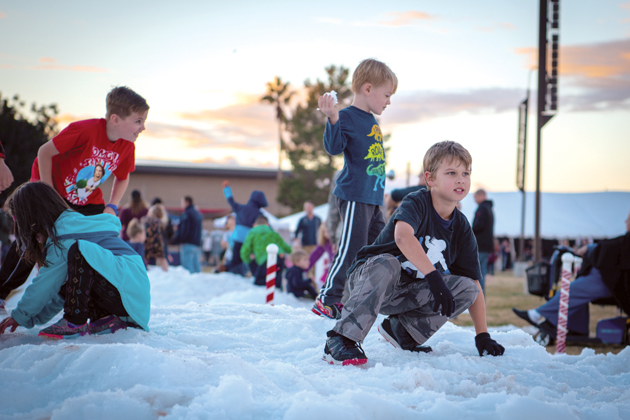 Children play on a pile of snow during Holiday Magic, Dec. 7, 2018, at Luke Air Force Base. Holiday Magic is an annual base wide event where children can participate in events such as meeting Santa, riding in a horse-drawn carriage and face painting.